Satisfy your inner culture vulture at Maritime Centre Vellamo and Cathedral of Porvoo. You'll explore and learn at Hvittrask and EMMA - Espoo Museum of Modern Art. 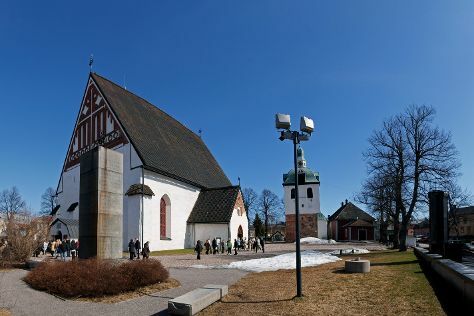 You'll find plenty of places to visit near Porvoo: Aurlahti Beach (in Lohja), Espoo Cathedral (in Espoo) and Kotka (Langinkoski Imperial Fishing Lodge Museum & Santalahti Nature Trail). To find traveler tips, reviews, maps, and more tourist information, go to the Porvoo online trip itinerary planner . If you are flying in from Norway, the closest major airport is Helsinki Vantaa Airport. In June, daytime highs in Porvoo are 21°C, while nighttime lows are 11°C. Wrap up your sightseeing on the 29th (Sat) to allow time to travel back home.